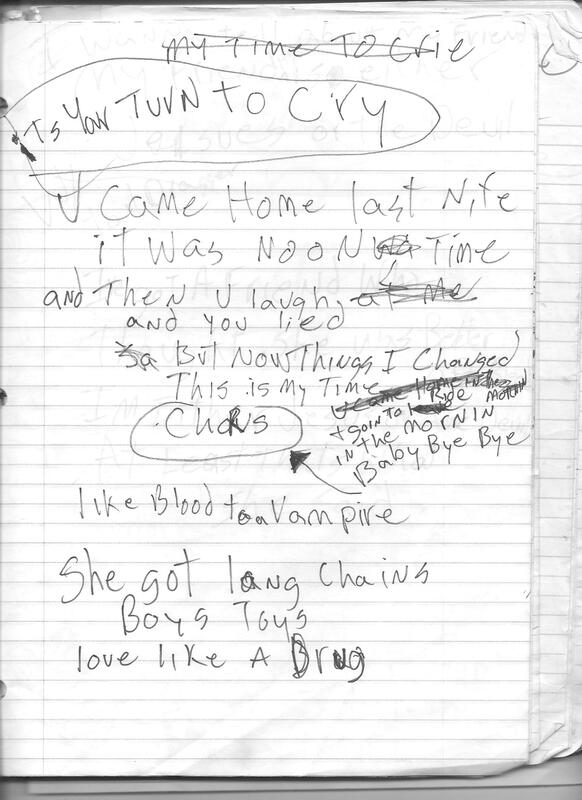 Posted in red devils with tags lester butler, mike flanigin, paul size, way down south, your turn to cry on November 15, 2011 by J.J.
A notebook belonging to Lester Butler gives a rare little glimpse into The Red Devils’ lyrics, setlists and creative process. The writings are in the hands of Paul Brown of the UK. Brown says he was in the crowd at the Devils’ May 4, 1993, gig at London’s Borderline. Afterward, he picked up the setlist left behind on the stage. The setlist turned out to be more than that. Jonny Ray Bartel essentially confirmed the authenticity of the one-of-a-kind notebook in a Facebook post: “Nice collection Paul. Looks like you have an entire notebook of Lester’s. Awesome …”. Posted in red devils with tags al sharpton, american recordings, def american, rick rubin on November 9, 2011 by J.J. 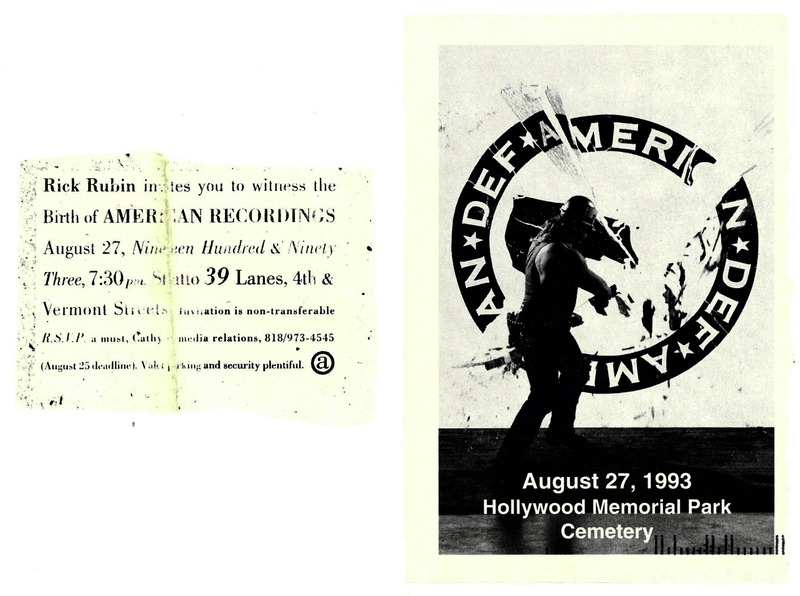 The Scene: “The Death of Def,” Friday’s publicity stunt/funeral service for the first word in Def American Recordings’ name. The company will now be known as American Recordings. The “ceremony of honored entombment” was held at Hollywood Memorial Park’s Chapel of the Psalms. The after-party was at Shatto 39 Lanes bowling alley. In a rock ‘n’ roll way, it made complete sense: First you go to a funeral, then you go bowling. The Cause of Death: Def began its brief life as rap-culture street slang. The deceased adjective once meant “excellent.” But, in an all-too-common story, the word started hanging around with the wrong element-suburban kids and record company executives. This led to inclusion in Webster’s dictionary. Nothing kills a hip word like mainstream respectability. The Buzz: It’s not like Elvis. Def is dead. Surviving relatives include fresh, fly and dope. The Last Rites: In an open casket were relics from friends of the deceased: hats, press releases, albums and harmonicas. Alongside were floral tributes. Beret-wearing Black Panthers stood guard with prop shotguns and AK-47s. After Sharpton’s eulogy, in a rare funeral appearance, the Amazing Kreskin did his mind-reading routine using Tom Petty and Rosanna Arquette. He also sent four mourners into spontaneous hypnotic trances. Overheard: “Are you guys cremating or burying?” asked a male guest. That question was soon answered. Mourners followed a 19th Century-style horse-drawn hearse and a six-piece brass band playing “Amazing Grace” past the mausoleum that holds Rudolph Valentino’s remains to a freshly dug grave with a simple black granite slab inscribed DEF. Who Was There: About 500 mourners at the cemetery, plus 2,000 more at the bowling alley. Guests at the chapel were older, the ones at Shatto Lanes more the Tattoo Generation. They included Petty, Arquette, Bushwick Bill, the Red Hot Chili Peppers’ Flea, Sir Mix-A-Lot, Swell’s Monte Vallier, Warner Bros. Records chairman (and pallbearer) Mo Ostin, Mike Bone and Depeche Mode’s David Gahan. The After-Party: Let’s just say the mourners bury better than they bowl. Dress Mode: Was there ever a record-company party where black was more appropriate? For women, a typical outfit was an all-black combo of veil, miniskirt, lace stockings and cowboy boots. American Recordings’ bereaved founder, Rick Rubin, wore a floor-length black cassock, Ray-Ban sunglasses, a white Sikh turban, strands of red Hindu rudraksha beads and left a thick wake of incense aroma as he entered the chapel. Most Persistent Afterthought: What kind of people are running this cemetery that they let rock ‘n’ rollers run loose in it? ROCK ‘N’ BOWL WILL NEVER DIE: The L.A. rock community is collectively nursing bowlers’ elbows after two major bowling parties last weekend. First, there was Rick Rubin’s combination wake for the term Def and birth of the new name for his company, American Recordings. With the mob scene at the Shatto 39 lanes-including Rosanna Arquette, the band Raging Slab and even Heidi Fleiss (at least those were the rampant rumors)-the actual sport quickly degenerated into inebriated stunt bowling, with people sending two or three balls down lanes at a time as the label’s Red Devils played rockin’ blues numbers. You are currently browsing the No Fightin': The Red Devils, Lester Butler & California blues, rock and roots music blog archives for November, 2011.